Minnesota is in need of a statement win. Michigan just needs to win. Both teams are on the bubble so I think the fight will be ferocious. Michigan is on bubble down while Minnesota is on the bubble up. 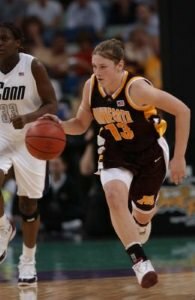 Minnesota has only lost once at home all season, a 5 pt loss to Nebraska. And Michigan has only one refgular season B1G game left and that's hosting Maryland. Losers 3 of their last 4 going into Williams they have a tough road. Not sure how much credit I give Stollings for a somewhat successful season but Gophers might actually make the NCAA tourney if they play their cards right. No Haley Brown tonight for Michigan. Minnesota de-commit Deja Church gets the start. Michigan is in. Even with losses tonight, against Maryland and in the first round of the Big 10 Tourney. The Committee had them in the top 16. You don't fall that far that fast. But their seed is dropping. As for Minnesota a win over Michigan would all but assure their entry. Their final two Big 10 games are against Indiana and Illinois, and 10 wins should put them in. Beating Michigan would let them slip up vs the Hoosiers. Serious foul trouble in the first couple of minutes for Michigan let a bit of wind out of their sails. Nicole Munger picked up her 3rd (!) early and had to sit. The good news is it gave Akienreh Johnson a chance to shine, scoring 10 in the first half. Gophers ended up at halftime 45-40. Michigan hits 3 threes to open the 3Q and take the lead. Midway through the third, Michigan 59-55. Michigan has a 33 point third quarter, leading 73-69. Pitts picked up her 4th foul. Minnesota goes on an 11-2 run to start 4Q. KBA calls timeout. Michigan 83-82 with 4 1/2 to go, Flaherty and Wagner both with 26. MN 88-83 with just over a minute left. 89-85 :31 left. Church fouled out. Michigan ball. Michigan turnover. Bell makes both free throws after she’s fouled. Minny may pull this out. This may well have put them in the NCAA tournament. I'm shocked. The Gophers had amazing control, committing just 5 turnovers.